Updated 1,2 April to include more photos and a few more details of how Wat Phra Dhammakaya is being attacked. The strong gusts of wind that battered our placards in the peace vigil felt symbolic of the forceful opposition to Wat Phra Dhammakaya, a temple being attacked on various fronts in Pathum Thani, Thailand. But we maintained our position and during the vigil I was among a number of participants interviewed to share what the temple and tradition mean to us and why we were taking part. 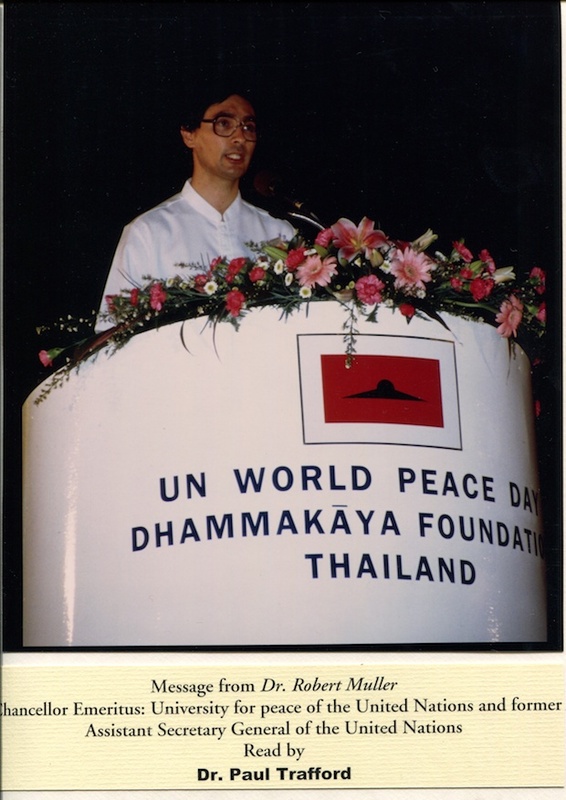 For my part, I reflected back to the turn of the millennium when Wat Phra Dhammakaya was host to a specially significant gathering. 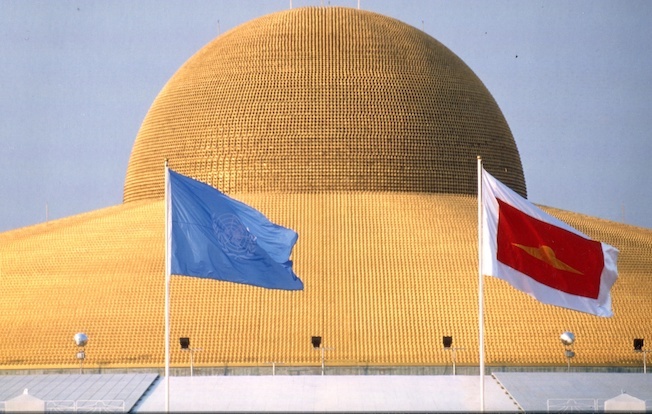 Formally represented by the Dhammakaya Foundation, a UN-accredited NGO since 1986, the temple participated in the UN One Day in Peace, adopted by the UN as part of a resolution on the University for Peace (nicely described by the The People For Peace Project), as a prelude to the International Decade for the Promotion of a Culture of Peace and Non-Violence for the Children of the World. Participation involved UN Members States, inter-governmental organisations, and non-governmental organisations around the world. 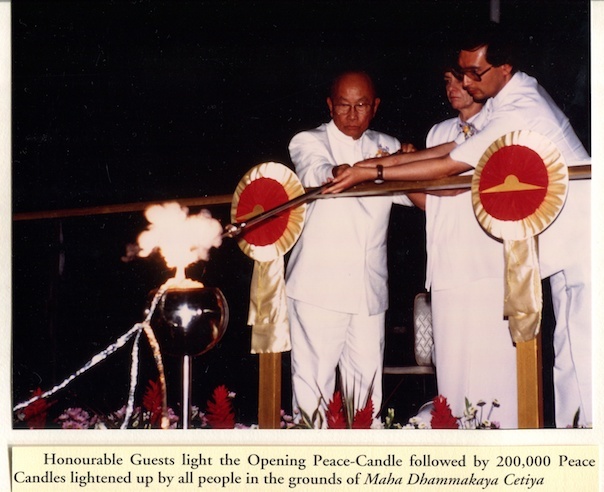 The temple marked the occasion by a 200,000 Peace-Candle Lighting Ceremony for “World Peace through Inner Peace” (which it has consistently promoted to resolve conflicts). It was organised in cooperation with the Millennium People’s Assembly Network, the Millennium Forum, Jubillennium, One Day Foundation and the United Religions Initiative. As well as broadcasting a video message from Kofi Annan, UN Secretary-General, a number of supporting messages were kindly provided by notable world figures whose initiatives were particularly significant for peace during the 20th century — Lech Walesa, former President of Poland and a Nobel Peace Laureate (in 1983), Dr Oscar Arias, former President of Costa Rica and a Nobel Peace Laureate (in 1987), and Dr Robert Muller, Chancellor Emeritus, University for Peace of the United Nations, Former UN Assistant Secretary General. One of the guests informed me that he had originally told Dr Muller about the event (they were neighbours), volunteering the caveat that the temple was considered controversial. 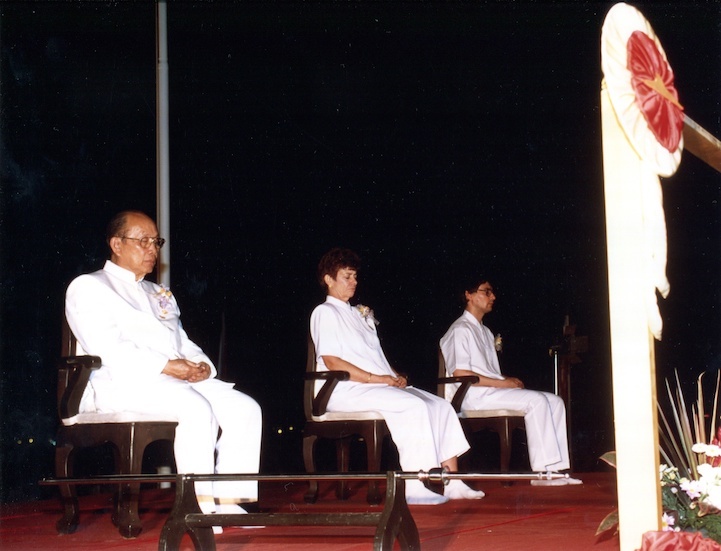 Dr Muller, who was known to appreciate meditation practice, replied that it was actually a sign of positive progress and gave his blessing. The central focus has always been meditation — the donations that come in are invariably to support this practice in one way or another, whether to build and maintain meditation facilities, including retreat centres, to fund teachers’ travel, or to develop instructional materials about practice. Inside temple grounds, one trains in a way that should always support this and during just a short stay I saw evidence of this: one of the temple staff who assisted me in preparing for the ceremony was called Ann. Ann had worked as an air stewardess, but expressed a preference for making meditation central to her life, to the extent that when she dreamt about her friends meditating she would get up and sit in meditation too. Reflecting its importance, for the ceremony meditation was scheduled for the last half hour of 1999, until the final minute. It felt exceedingly peaceful all round, even though it was surprisingly humid that night for the middle of winter (of course, Thai winters are not like British winters!). Only then was it time to light the candles for peace with Mrs. Marcia Brewster and H.E. Mr. Padung Padamasankh, both of whom have far more experience of the United Nations than myself. Looking back, browsing through a beautiful souvenir photo album, I feel wonderment and gratitude, especially to Luang Phor Dhammajayo and Luang Phor Dattajeevo (Abbot and Vice Abbot respectively) for having the vision and loving kindness to enable such a momentous gathering and to all the staff, particularly Dr. Siriporn Sirikwanchai, who facilitated everything with such helpfulness. Some edited highlights were prepared and dispatched to Times Square in New York, helping people there to celebrate the Jubillennium, entitled Jubillenium Thailand Dhammakaya at the Maha Dhammakaya Cetiya ! Subsequent events, such as September 11th, 2001, may have dimmed lights around the world, but the intention and conviction for peace remain deep. Wat Phra Dhammakaya, through projects grand and not-so-grand, is offering a beacon of especially inner light for the world. But this is now under serious threat owing to actions being taken by the Thai military government and its supporters. As I write, it looks like the DSI’s visible siege of the temple will halt for the time being, but I suspect that is because efforts are being concentrated elsewhere, mainly to bring in outsiders to control the temple (and hence its practices and assets). Currently, the tactical operation is targeting senior figures, monastics and lay people: so not only Luang Phor Dhammajayo and Luang Phor Dattajeevo have been charged on various counts, but also experienced monastic and lay disciples — all of which are contested. It’s as though there is a factory to fabricate anything to take over by any means available. For example, on 25 March it was reported in the Bangkok Post (which has long been antagonistic to Wat Phra Dhammakaya) that there are “21 suspects” wanted in connection with alleged land encroachment. Among them Luang Phor Dattajeevo and Dr Siriporn Sirikwanchai! Another person in their list is Saowanee Siripongboonsit. Khun Saowanee is a very experienced UN worker — she was one of the 123 staff singled out for distinguished service when the Nobel Peace Prize was awarded to the UNHCR in 1981. These are honourable people, not criminals. Some observers have said that Buddhist affairs in Thailand needs reform. Based on my experience over the years — of this and other Buddhist monasteries and centres — I see the right kind of reform already underway at Wat Phra Dhammakaya. It’s something that Thailand should be proud of and I wish to encourage anyone who values peace to come and help preserve it. 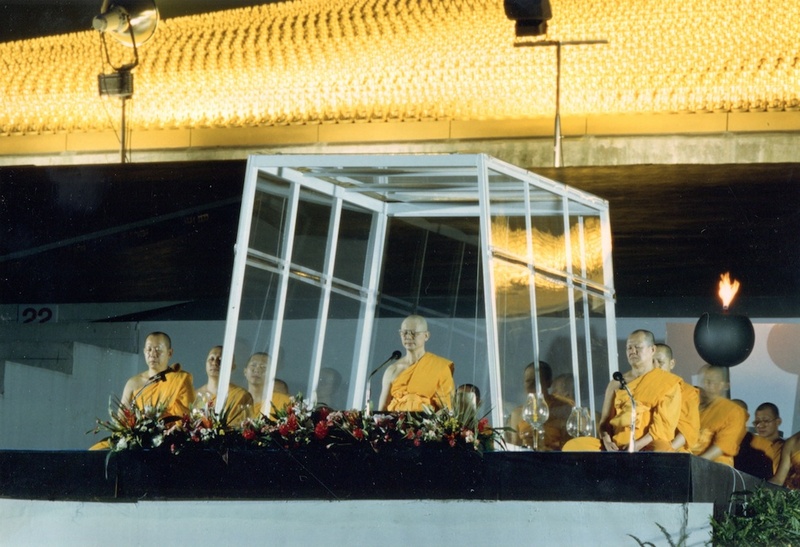 This entry was posted in Editor's Picks, News and tagged Buddhism, Dhammakaya, lights of peace, Thailand, UN. The Inner Peace Weekend Meditation Retreat 15th for 3 days from 24 March 2017 to 26 March 2017 at Dhammakaya London Temple. Tuesday Meditation Class for Locals at Wat Phra Dhammakaya London;April 11, 2017.